Analytics represent the next frontier in the ability to derive value from information. With analytics, organizations can gain deeper business insight, greater brand experience, and better efficiencies. That's why we welcomed Actuate, a leader in embedded analytics, to complement our existing information management and B2B integration offerings. In this issue, we'll look at why analytics is so hot, what Actuate brings to the table for you, and how OpenText Trading Grid Analytics can help. 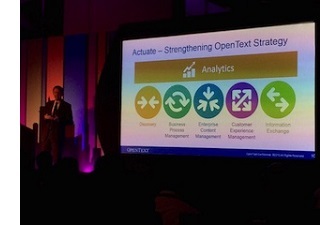 With IGC joining OpenText we will also review how OpenText Brava! helps companies strike a balance between document accessibility and security. Finally, we will see what's happening during our Innovation Tour starting in Mumbai, Tokyo, and Sydney this month, and if you keep reading you will find out where Enterprise World will be held in 2015! we made those tools more powerful so we could incorporate external data as well as internal data. We can take analytics ever further, though: we can learn from the data we gather and develop new valuable products and services. The new capabilities can't be developed using old analytics models. The big data model was a huge step forward, but it won't offer an advantage for much longer. Companies that want to prosper in the new data economy must once again fundamentally rethink how the analysis of data can create value for themselves and their customers. And we want to help them achieve that goal. Which Industries Are Leading Cloud Adoption? iHub Data Visualization Platform is for developers who want to create data-driven apps. Big Data Analytics "Appliance" is for business users who need to access, blend, explore, and analyze all their data. Content Services is for ECM architects who want to engage with their customers at the right time, in the right format, and on the right device. Did you know that Actuate has one of the world's largest developer networks serving more than 3.5 million developers? Why so popular? It's got scale, it's got an open platform, and it's easy to embed and get started. 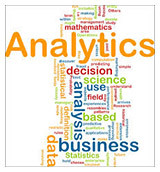 Read more about the embedded analytics imperative. We're all under pressure to ensure easy access to files anytime, anywhere, on any device, but unless we secure that information, we run the risk of security breaches. How can organizations strike a balance between accessibility and security? Give your data the respect it deserves. Consolidate your disparate systems into one trusted network. For a limited time, OpenText is offering ONE FREE YEAR of cloud hosting as part of a three-year advanced commitment! Click here for a free consultation week to assess viability. The top benefit of predictive analytics is achieving competitive advantage. CIOs rank analytics as the #1 factor contributing to competitiveness…but what exactlyis it? Boscov's, the largest family-owned department store in the US, uses OpenText Trading Grid to automate and streamline its B2B operations. Watch the video. The 2015 Innovation Tour continues the discussion we began in November at Enterprise World about the Digital-First World. What will it look like? How will it operate? What opportunities will it bring for your organization? Recent technical innovations, evolving demographics, and mass digitalization are changing the way information is produced and used. Meet us for the day to discuss how you can simplify, transform, and accelerate your EIM to become a Digital Enterprise. Stay tuned for our industry plans at the North America Innovation Tour cities, and be sure to check out the Industry Insights community for what's trending. Grab your pencil and book it off: Enterprise World 2015 is landing in Las Vegas, Nevada the week of November 8-13! Pre-register today! Need tips for building a successful online community? Here are the top four. Working on long-term brand relationships? This CMSWire article touches on using analytics to personalize and manage them.